Lightenex® Plus cream is a strong skin lightening cream, which is excellent to lighten epidermal hyperpigmentation, e.g. dark marks left by acne, scratches, cuts. Independent trials have shown up to 76% reduction over a 12-week period. Lightenex® Plus is particularly effective as a maintenance skin lightening cream for normal skin tone, after dermal hyperpigmentation (deep melasma) has been treated. The Actives not only treats the recurrent pigmentation, due to the skin whitening ingredients, but also prevents further darkening due to the incorporated sun screen. The Professional Strength Skin Lighteners include Azeleic acid, Phytic acid, Liquorice extract, Citrus Unshui peel extract, Arbutin, Dioic acid, Vitamin C, Salicylic acid, & Vitamin E in a Titanium dioxide base. The carrier system of the special formulation is designed to penetrate the tougher skins of the darker skin toned people. However, it is strongly recommended to apply a total sun block on top of Lightenex® Plus cream to get maximum protection against the harmful UVA & UVB rays of the sun. Wash the skin & massage Lightenex® Plus two hours before going to bed on cleansed face until stinging. Use as short contact (2 hours & wash off) on sensitive parts i.e. groin & arm pits, under eye. 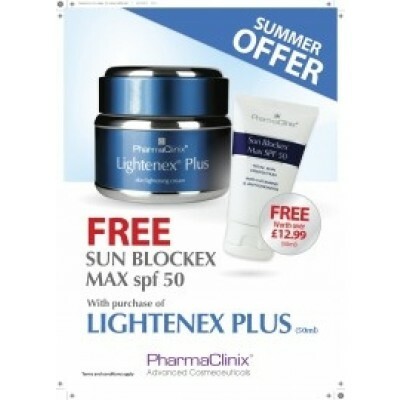 Only apply total Sun Blockex® SPF 50 twice during daytime even if indoors. Do NOT use bleaching cream containing steroids. 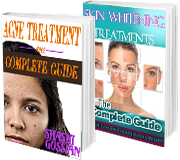 These can cause permanent skin damage including permanent redness, thinning and blood vessel streaks.